Unidentified gunmen opened fire with AK-47 assault rifles at the house of Greg Espinosa at around 4:30 a.m. Saturday and wounded two persons, one of them an off-duty policeman. The crime took place less than 100 meters from a police detachment. Strangely, the policemen didn’t respond to the strafing until an emergency ambulance crew informed them that two people were badly hit in the area. A notorious criminal who frequently served as bodyguard of Iloilo City mayor Jed Patrick Mabilog during his visits to Barangay Monica was arrested by police recently for the crime of murder. The suspect, Benjamin Espinosa, is the right-hand man of Jing Jing Espinosa. He is charged for the murder of trisikad driver Jimmy Bais in the victim’s home in Barangay Monica in September 2012. Espinosa is now detained without bail. Benjie Espinosa is also accused along with Jing Jing for the shooting of their uncles, Pascual “Toto” Espinosa III, Leo Espinosa and Sergio “Kap Boy” Espinosa three years ago. The Department of Justice has rejected a motion for reconsideration filed by alleged drug lord Jesus “Jing Jing” Espinosa Jr. on the resolution finding him and his first cousin, Benjie Espinosa, culpable for two counts of frustrated murder and one count of attempted murder. In a resolution handed down last week, DOJ assistant state prosecutor Rohairah A. Lao, the DOJ ruled that there was nothing new in the arguments raised by Espinosa that have not been exhaustively tackled in her resolution dated October 12, 2012. Hence, her resolution on the case still stands, she said. With this resolution, the Iloilo Regional Trial Court Branch 26 under presiding judge Antonio Natino is expected to issue warrants of arrest against the Espinosa cousins for allegedly shooting their own uncles — Pascual “Toto E” Espinosa III, Leo Espinosa and Sergio Espinosa — shortly after midnight on June 1, 2010 outside the victims’ ancestral house in Barangay Monica, City Proper. Jing Jing Espinosa rose to prominence last year after he posted photographs showing his close friendship with City Mayor Jed Patrick Escalante Mabilog, Congressman Jerry Trenas and Vice Mayor Joe Espinosa III. 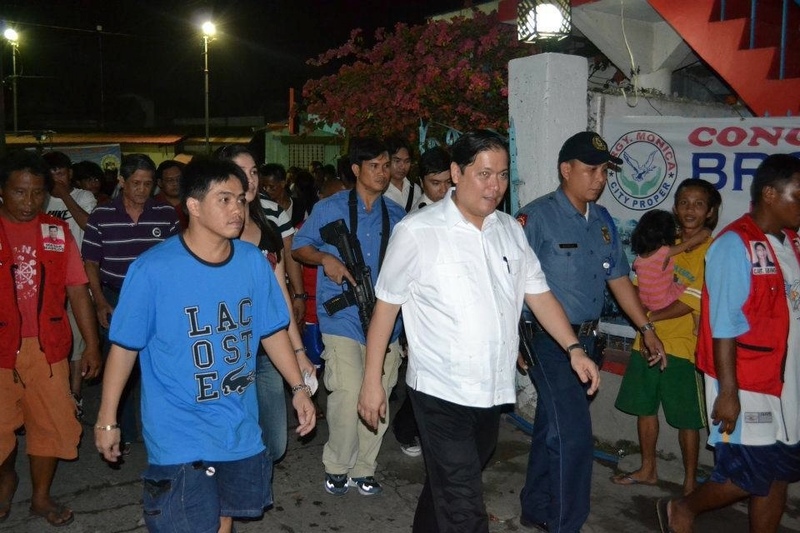 City Mayor Jed Patrick Mabilog is always accompanied by Armalite-wielding security men whenever he goes around the city. His favorite place to visit is Barangay Monica, City Proper where Jing Jing Espinosa plays the role of a gracious host. In a series of FB private messages and blog comments, Jing Jing Espinosa has sent a strong warning against the reportage I’ve been doing on his cases. Jing Jing is now facing two counts of frustrated murder and one count of attempted murder for trying to kill his own uncles on June 1, 2010. Jobless, with no legitimate business, Jing Jing has erected a 5-story residence in Barangay Monica City Proper where City Mayor Jed Patrick Escalante Mabilog is a frequent visitor. Mabilog shrugged off Jing Jing’s dark past as a convicted killer and a reputed drug lord as irrelevant. He said he is proud of their friendship and counts Jing Jing as his number one supporter for his re election bid.